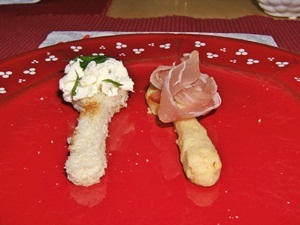 Finger food is perfect party food: the one hand holding a glass, the other hand free to grab a delicacy. Be it garden party, a festive event for your family, a nice board games evening, an exquisite wedding buffet or for a Halloween party. Our finger food for edible fork and spoon uses the cleverness of the cutters fork and spoon. 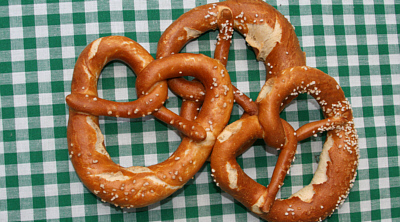 They are small enough to be ideal finger food and are good to grab. By the way: this type of finger food makes a great Amuse bouche, or starter to a fab menu – this will make the guests happy and allows hos and hostess to have a little chat with their guests before the first course will be served. When planing the food for a party we like to serve well approved recipes and we love to try out something new. Sometimes it is the variation of well known classics that does the trick. The variation is usually in the way we decorate and arrange the food. 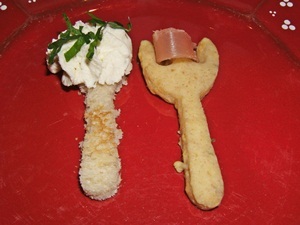 Cheese cookie batter is used to cut out forks, the dents of the fork are used to hold Prosciutto, from a toast spoons are cut out and decorated with a delicious spread. Ideally you start a day ahead by preparing the short crust pastry for the cheese cookies. Put the batter into a bowl, put a lid on it or close it with cling film and leave it in the fridge. You should at least leave the dough for 30 minutes in the fridge, better is a whole day cooled day. Roll out the dough, about 5mm thick and cut out the forks. Bake at 275 degrees for 12 minutes. 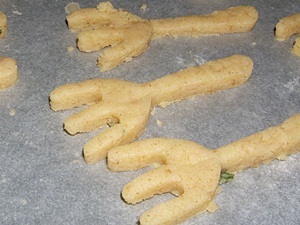 Let cookies cool – the amount we used is enough for two trays of fork cookies or at least 24 cheese cookies. In the meantime toast the bread – out of each toast you can cut 3 spoons. Cut the toast when it is not completely cold, as there will be less bread crumbs. Fill the spread into the piping bag and pipe a rosette of spread on every spoon. To have this special curly flower, make sure that the nozzle is close to the toast – ready to pipe. After piping add some parsley (or another herb, depending on the spread recipe) on the spread swirl and your edible spoons are ready to serve. Cut Prosciutto into long stripes and place a prosciutto stripe around the dents of your fork. In case the cookie is to crumbly and break to easily, you can put a rose of prosciutto on top of the fork.